Death, as we all know, isn't just for the dead. In fact, as the deceased lay in a state of permanent nothingness, death can be described as a state which exists mainly for the living. The specter of nothingness, what happens to each of us when our hearts stop beating, is something which haunts us every day. Our impulses, our fears, all stem from what will become of us when our impermanence becomes permanent. 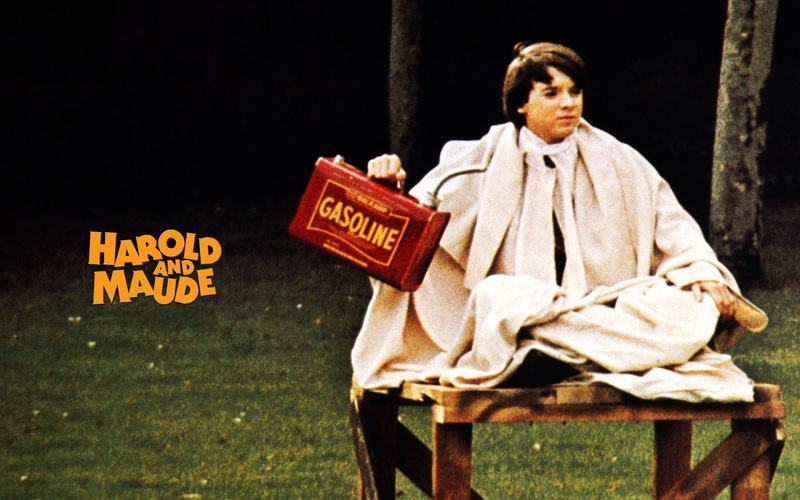 Harold and Maude, the classic Hal Ashby movie, is a film very much about the dead and the dying. The feature presents us with an adolescent hero, Harold (Bud Cort), obsessed with the notion of disappearing into the void, of exhaling a breath for the last ever time. Darkness consumes him to the point it rules each of his waking hours - when not staging elaborate tributes to suicide, young Harold finds himself crashing the funerals of those he doesn't know. His life is spent peering over the edge, looking downwards into an abyss which will one day swallow him whole. Yet, if death truly is nothingness then life must be, if not the exact opposite, at least something. The period we spend sandwiched in-between an eternity of absence, of non-existence, must bear some meaning. Hal Ashby, one of the great overlooked directors, shows us that if death is for the living, then life certainly is too. Unexpectedly, it is a fellow funeral-goer, a 79-year old woman, who reveals these truths to us - she may, too, have come close to falling into the abyss but, instead of focusing on the blackness in front of her, Maude (Ruth Gordon) spends her days remembering the vivid colours over her shoulder; the white petals of a daisy; the yellow wings of a canary. Death will surely dull us all but, whilst we have air in our lungs, we can each live life as a melody, bright and to be sung out loud. 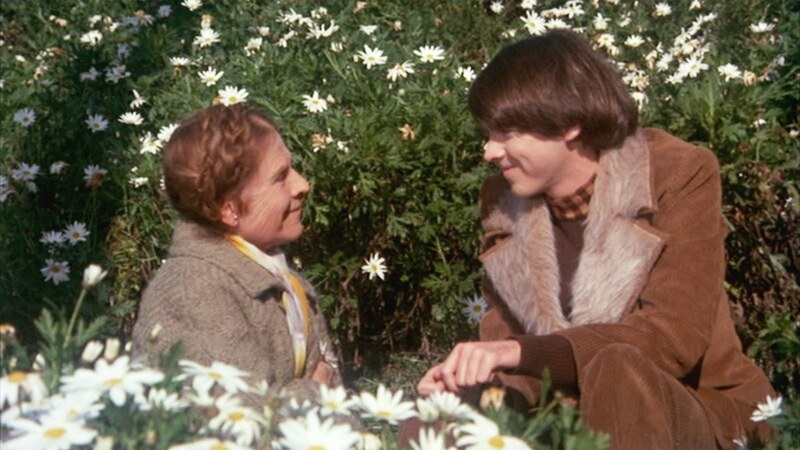 In the four and a half decades since the release of Harold and Maude, the film has quietly grown in stature, blossoming from a sweet low-key romance into one of the most influential movies to ever come out of America. If Maude sounds perilously close to fulfilling the role of the Manic Pixie Dream Girl trope, of the kooky woman who teaches our romantic hero how to truly live, then that is perhaps because she was the first - undoubtedly, she's the best too. Without Ashby's film as a template, its very unlikely that any of the Rom-coms of the 1980s onwards would take the form they do. Similarly, the unusual combination of off-the-wall humour, formal composition and unexpected deadpan pathos clearly found their way into the work of Ashby's spiritual heir Wes Anderson. Without Ashby, and without Harold and Maude in particular, cinema would be a much poorer art-form. Of note, too, is the final key ingredient of the movie - the one which, alongside Colin Higgins' script, Ashby's direction and the chemistry of the two leads, creates the timeless magical, alchemy of the film. The soundtrack, as provided by Cat Stevens, is nothing short of luminous; each tender moment in the feature is amplified by the accompanying sonic textures of the singer's compositions. Whilst the world may still love a cage, as we listen to these graceful melodies and watch the extraordinary scenes they accompany, Ashby's film make us feel like we can fly like glorious birds. He reminds us that no matter how ordinary the lives we are living appear to be, the fact that we are living, that we are alive in a world full of trees and birds, is truly extraordinary.